This year’s Rainbow Ball once again celebrated diversity with the usual sass and class. The opening ceremony was choreographed as a pro-EU message, with dancers wearing blue unitards emblazoned with the EU- flag; afterwards, the debutantes smiled brightly as they stumbled through their routine, trying to remember the steps they had practiced. 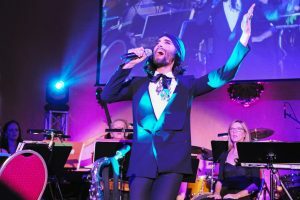 A refreshing amount of diversity was present, including the face of the ball and Austria’s Eurovision pride, Conchita Wurst. To make the ceremony more accessible to the hearing impaired, screens were displayed outside the ballroom with a sign language interpreter, which was also live streamed online. The night had an air of absolute happiness and acceptance, with a refreshing dose of diversity on the dancefloor. In the bathrooms, lipstick was passed around and drag queens helped each other zip up their dresses. Dressing up for a ball can often be stressful with hair and nail appointments to ensure the perfect look but the Rainbow Ball stayed true to its inclusive message and equally welcomed the casually hip and those dressed to the nines in 10-inch heels and wigs that reached the ceiling. Overdressing was practically impossible, as men in bright floral suits and women in rainbow tutus one upped each other to steal the show. 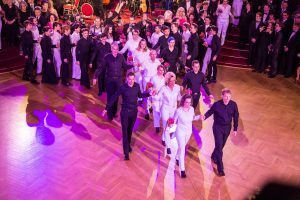 The program was packed, offering dozens of possibilities to enjoy the night: The dance floor was open to all, with a who’s who of local celebrities gyrating to the beat like Jeannine Schiller (Austrian model and socialite). The disco room with dancing till dawn, fueled by popular songs from the 1990s and 2000s, while the main floor alternated between the more traditional Viennese waltz and an ABBA cover group, ensuring everyone could be a dancing queen – no matter what age, gender, sexual preference or ethnicity. The “Manne-quins,” probably Vienna’s most famous group of drag queens performed throughout the night with flamboyant outfits and elaborate acts that dazzled the crowd. As the champagne flowed, the bijou bar got philosophical, with patrons pondering quanderies like “How have there been no lesbian princesses? Cinderella was probably lesbian…” By the end of the night, pink boas and rainbow glitter cluttered the floor; evidence of another successful ball night coming to an end.